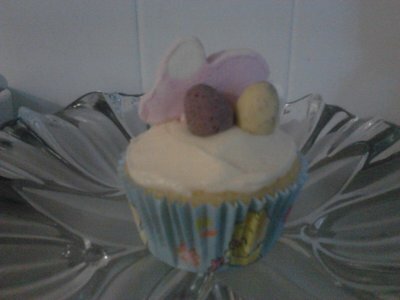 Here is a really simple way to decorate cupcakes for Easter. 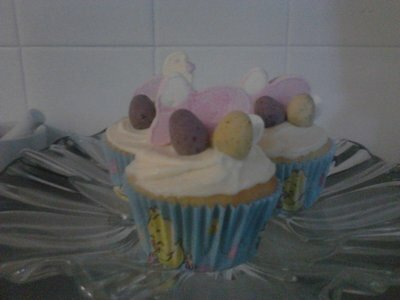 The addition of Easter cupcake liners, marshmallows and eggs gives basic cupcakes an Easter look. They taste great and are easy for kids to make. Make the vanilla cake mix according to the instructions on the pack. Place the cupcake liners inside a muffin tray. Spoon the cake mix into each liner, filling each around half full. Bake for 10-12 minutes in a moderate oven or until golden brown. Place the cupcake on a cake rack to cool. Once they are cold, the cakes are ready to ice. If your cake mix already came with an icing pack you can use that. Follow instructions on the box to make the icing. If not, heres the recipe I use for butter icing. Combine all ingredients into a bowl and mix with an electric mixer. You may need to add a bit of milk if the mixture is too thick. Mix until pale in colour and the consistency of whipped cream. Spread the butter cream on top of each cake. Now decorate with the marshmallows and chocolate eggs.